Well, I certainly didn’t see that coming. All this time I’ve been trying to show you images of beautiful landscapes from around the world, and it turns out that what you really want to see is pictures of me with hair. I have no idea why. To make dartboards? Win a bet with your friends? Have a good laugh? All I know is, last week’s post, Old School Selfies, was the most popular of all time. For the first time ever, both readers on my mailing list clicked on the link to my blog. I still don’t know if they actually read the thing. So this week I want to tell you a little more about my experiences on the trips where those “selfies” were taken. It seems Mobil Oil Indonesia had asked me to come to Sumatra to help them install a new natural gas measurement system. I had extensive experience with this system from consulting to their New Orleans office, where my team had already installed one, and I was eager to travel, so it was a perfect match. Getting to the site was interesting. Well, maybe complicated is a better word. For starters, you need a work visa, which Mobil arranged to get from the office of the Consulate General of Indonesia in Houston. Then my client was nice enough to let me fly Business Class, which as I recall was something like $4000. That would be over $8000 in today’s dollars. So one Saturday morning I got on a plane in New Orleans, where I flew to Portland, OR, then to Tokyo, then on to Singapore, arriving early on Monday morning. I stayed in Singapore until Wednesday, recovering from jet lag, and then it was on to Medan, Sumatra, where I caught a private Dash 7, known for its extremely short take off and landing requirements. I finally arrived at the Lhoksukon airport, ready to report for work. I keep saying “I”, but that’s not exactly accurate. Not for my first trip, anyway. On my first trip, I was accompanied by my lovely (former) wife Catherine, because, the real purpose of the trip was for Mobil to convince me to move to Indonesia for a year or two, and my consulting firm thought it only fair that my wife be around to weigh in on the decision. 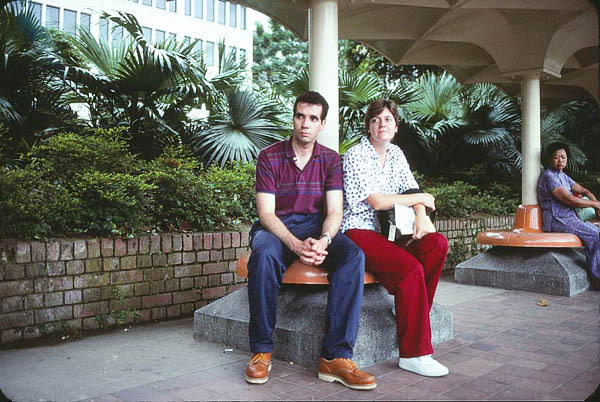 Ed and his then wife Catherine sit jetlagged at a bus stop, in Singapore. We were assigned to stay in the visitors’ guest house, where an electrical engineer from my firm, the late Jim Bassich, and his wife Cynthia had been staying since they arrived a week earlier, but that didn’t last long. No, the day we arrived was the day the manager, Warren, left for his month of annual leave back in the States, inviting the four of us to move into his five bedroom house to watch the place. This also meant watching the driver/gardener and cook/maid, who spoke no English. OK, this was going to be fun! 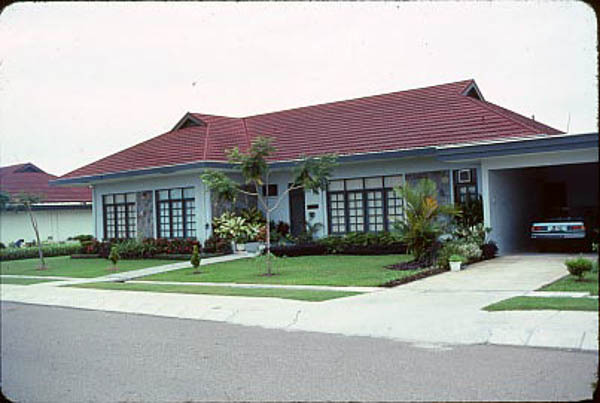 Warren’s House at Bukit Indah, in north Sumatra, Indonesia. 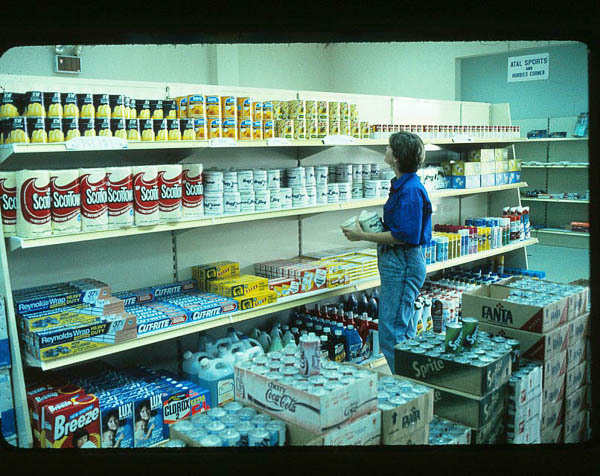 The very first thing that happened was that we arrived back from the office one evening to find the electricity off, the fish in the 50 gallon aquarium dead, and the freezer full of thawed, stinking meat. Great. Jim, of course, jumped right on the problem, found the short, and immediately figured out that the electricians who had wired the house had not been trained in the proper way to remove insulation from electrical wire. We weren’t going to mess with the repair ourselves, but when the electrician came out, you can be sure he wasn’t allowed to make the same mistake again. I suspect this was neither the first nor last time an electrician had to be called out to repair a short at Warren’s house. The place where Warren and the other managers lived was a beautiful subdivision-like compound known as Bukit Indah. It contained various levels of housing, a commissary, a restaurant/bar, swimming pool, etc. At the bar we got to meet other expats, and tried to get a feel for conditions in the area. We had already heard that it was extremely unwise for expats to drive, and that’s why everyone hired a driver. We heard stories of what happened in this eye-for-an-eye culture, where if you hit and killed another person, well, you can imagine what would happen. So that risk was outsourced, as it were. Then there was the issue of going “to town”. The nearest population center was Lhokseumawe, and going into the city was not advised. No, it wasn’t safe. But if you simply had to go look around, get your driver to take you, and whatever you do, do not ever give money to a beggar. The children will run up and hound you for money, and if you give any to one of them, the rest will mob you, or rob you, or who knows? You’ve been warned. 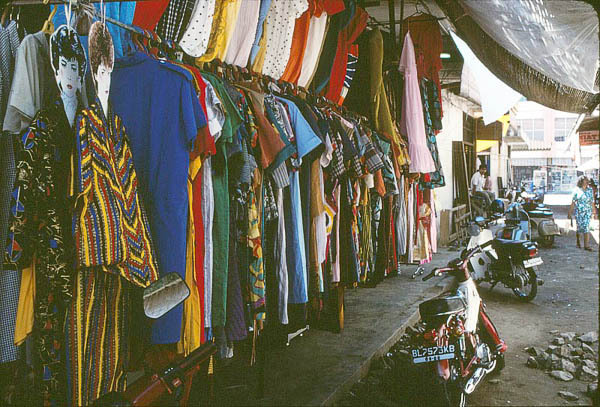 Shops in Lhokseumawe, north Sumatra, Indonesia. Well, we knew that gold was relatively cheap around these parts, and some of us wanted to visit the gold shops in town, so off to town we went when Saturday rolled around. We let the driver take us, of course, and we visited the various open air shops in downtown Lhokseumawe. We stopped for lunch to try the national favorite, nasi goreng, meaning “fried rice”, typically served with a fried egg on top. I distinctly remember the price for a lunch of nasi goreng – 500 rupiah, which was about 30 cents in those days. And it was good! 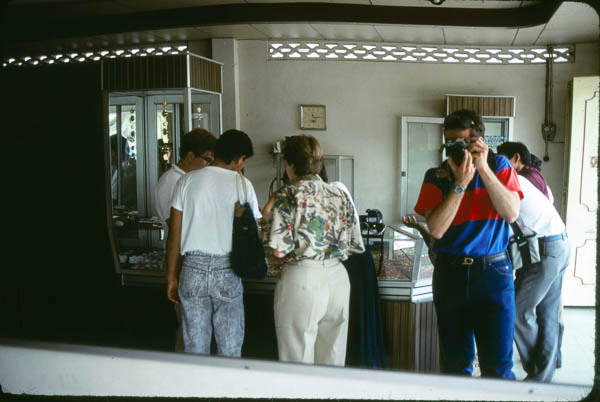 Ed photographs himself and friends in a mirror in a small gold shop in Lhokseumawe, Sumatra, Indonesia. Many of you probably watched the Oscars Sunday night, but those actors and actresses had nothing on us when we went shopping in downtown Lhokseumawe. We were the stars of the show, with locals coming from everywhere to watch us shop. (This was my first clue that the expats never actually came to town, for we were clearly an oddity.) It was a bit eerie, because they were so numerous yet so quiet. You’d be in a shop, looking at whatever was for sale, and you’d get this feeling of being watched. You’d turn around, and about 100 people would be standing there, smoking, looking the other way. Catherine, with her lighter colored hair, was a particular hit, and every child in town wanted to touch it! 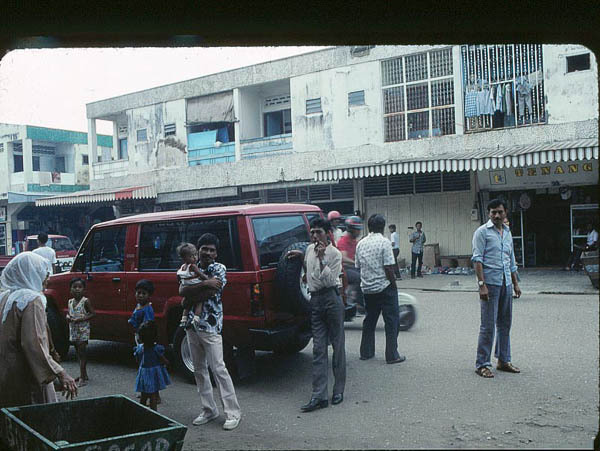 Locals crowd around our van in Lhokseumawe, Sumatra, Indonesia. At one point, a little girl ran up to me and held out her hand. In it was a 20 rupia note – virtually worthless. I couldn’t understand what she was saying, but I assumed she was asking for money (“I only have 20 but I need X to buy Y”, perhaps), but remembering the stern warning we had received from the “expert” expats back at the bar, we ignored her and kept moving back to the van. After we had returned to Warren’s house, as Catherine exited the vehicle, a wad of money fell out of her back pocket onto the seat. I scooped it up and handed it to her – and then it hit me. Catherine had been dropping cash, and this little girl was trying to return it. Wow. I felt really small. I was beginning to figure this place out. The expats at the bar didn’t know a thing about this culture, because they were too afraid or too disinterested to get out and learn about it. The next day was Sunday, and having nothing better to do, we went back to town. We were barely out of the van when a man came running up to me, angry as hell, and handed me, you guessed it, a 20 rupiah note. I didn’t understand a word of Indonesian (yet), but I knew exactly what he was saying. How dare I insult his little daughter by ignoring her when all she was doing was trying to return money Catherine was dropping! Yeah. You can’t trust these people. They’ll rob you blind. Just wanted to let you know that I use various means to visit your blog, Ed. 🙂 Not only is your photography entrancing, but your stories are wonderful too. I’m enjoying the Old School Selfies. These sure brings back a lot of memories though our clothing and hair style choices are questionable, lol. Keep it up and know that I’ll be clicking one way or another to read and see what you have to share. Thanks, Deb! Glad you enjoyed it! I didn’t even remember you taking all of those photos. Thanks for the memories! It was a beautiful country and I’m glad I got to see it. Yep, I had the brand new Canon EOS 650, the first Canon with the new EF lens mount that’s still in use today. It certainly was a beautiful place, and I’m glad we all got to experience it. But stay tuned – there’s more to come! Ok, make sure you show my “good” side! Sorry, I lied. That’s the Canon AE-1 in the reflection. I had the 650 for the next trip. Who knew that you used to be so handsome? I’ll take that as a compliment, Michael. I think. Ed, thanks for the additional inside scoop on the photo’s. Great blog, and thanks for a few good laughs!